First I just want to apologise for the poor quality of the photo's in this post. Now I understand I'm no photographer, but these are really bad! 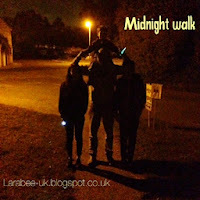 A 'midnight walk' is something on our autumn bucket list we wanted to introduce this family tradition to T this autumn and he absolutely loved it! It's something we used do with The Teens when they were smaller. We went out at just after 8pm, T really should have been in bed by this time, but on Friday's when The Teens come, we let him stay up until he crashes so he can spend as much time with them as possible. Anyway, I muted the idea to him after we had dinner, and said 'look it's dark outside, shall we go for a midnight walk and look for bats and owls?' Within minutes his welly boots were on and he'd found his torch! 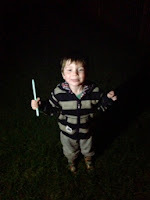 I also gave him a glowstick which he didn't put down. T wanted to go and find the owl, so we headed into the centre of the village, where the alpaca paddock is, we said hello the alpaca's and listened out for the owl again, we never actually managed to see any bats or owls, but we had a fantastic time on our walk. We'll certainly be taking more walks in the dark with T and hopefully next time we might just get a glimpse of some bats! We also like night walks this time of the year (or even later in winter). There is much to listen out for in the dark, and children are often intrigued by what's out there in darkness. Sounds like you've had a really good walk that night! So true, and yes in the crisp snow in winter is really magical. A night time walk can be such fun and even more so when it is past bedtime. I love the glow sticks.